Do you have a leak in your pool? Swimming pool leak repair is very important if you want to protect your pool and your wallet. Leaks can be extremely expensive for owners. Aquaman leak detection has built a reputation on providing excellent service and backing up their promises with action. We strive every day to be the the best in our business. Not all Leak Detection Companies are Equal! We have often been the fourth company hired to solve a leak problem that others couldn’t! We know how important it is to make a perfect patch and not create an eyesore. We are very clean and meticulous when we are making a swimming pool leak repair. However not all leaks are created equal and may require a bit more epoxy to get you through a long term fix. All of our repairs are covered under a warranty. If you are interested in or would like to learn more about our process or warranty, feel free to contact us. We stand by our work, but just to make sure that you feel like you are getting the best service, we created the best and most comprehensive warranty in the industry! When making a swimming pool leak repair we always choose the proper product for each task. 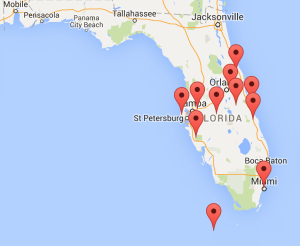 With multiple locations all across the State of Florida!